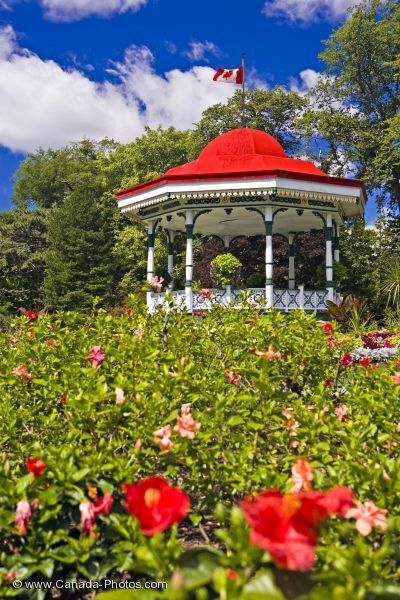 The band rotunda adorns the Spring Garden Road in the Halifax Public Gardens in Nova Scotia, Canada where blossoms on various types of plants and flowers begin to show their beautiful colors. A Canada flag stands atop the band rotunda as trees decorate the backdrop and the clear blue sky scattered with fluffy white clouds which slowly drift overhead. Band Rotunda at the Halifax Public Gardens along Spring Garden Road, downtown Halifax, Halifax Metro, Halifax Harbour, Nova Scotia, Canada. The Halifax Gardens were opened to the public in 1875. Picture of the beauty along the Spring Garden Road in the Halifax Public Gardens in Nova Scotia.